The Strawberry Tree, is an evergreen shrub or small tree, which can reach a height of up to 20 feet, but is often trimmed shorter. It produces masses of drooping, beautiful white flowers, which are often tinged with pink or green. They are bell-shaped, and honey-scented. The tree carries both mature fruits and flowers at the same time and is then incredibly beautiful. The fruits, are over 1/2 inches in diameter. They ripen through yellow to scarlet and deep crimson. From a distance, they look like strawberries, hence the plant's common name. The taste of the fruit is described as sweet. They can also be cooked and are used to make delicious and nourishing jams and preserves. They are also used to make the best "Tsipouro" and other wine! Hardy in zones 7-11. In cooler regions the Strawberry Tree makes an excellent patio plant, moved outdoors in the summer and indoors in the winter. It can be kept trimmed at any height. 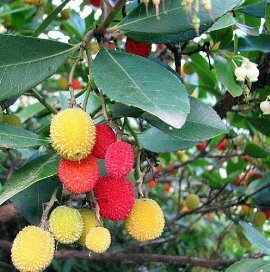 The Strawberry Tree, Arbutus unedo is an evergreen shrub or small tree, which can reach a height of up to 20 feet It produces masses of drooping, beautiful white flowers, which are often tinged with pink or green Hardy in zones 7-11. Also makes an exotic bonsai. In cooler regions the Strawberry Tree makes an excellent patio plant, moved outdoors in the summer and indoors in the winter The starter plant you will receive is growing in a 4" pot.